Find hotel near Planete Musee Du Chocolat .. This is a tasty exploration of the history of Cocoa and Chocolate in what is known as the Chocolate Museum of the city. As you enter the museum you will be welcomed with a nice tasting session followed by a 15 minute video that tells you about the secrets of chocolate. They have a fantastic collection of chocolates and chocolate making processes. At the end of your tour you will be offered a hot chocolate made with old and tastier chocolate. They also organize chocolate workshops and other activities. For the kids they have chocolate decorations and making lollipop for birthdays and occasions training sessions. The museum also tells everyone about the adventures of chocolate from Mayan times till today. September – June: Ticket office open until 5:30pm. Buses 10, 13 ad NSCH till Labordotte. Love this? Explore the entire list of places to visit in Biarritz before you plan your trip. Fancy a good night's sleep after a tiring day? Check out where to stay in Biarritz and book an accommodation of your choice. 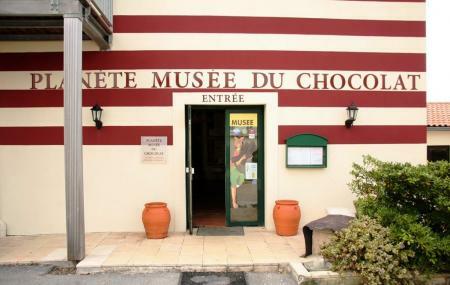 How popular is Planete Musee Du Chocolat Biarritz? People normally club together Cite De I'Ocean and Cote Des Basques while planning their visit to Planete Musee Du Chocolat Biarritz. Love this museum and it's great boutique. First of all, I would not recommend this museum to any non-French speaking people. Before paying entry (6 euros/adult), we were assured there were descriptions in English. We were then given four tiny pieces of chocolate to sample and directed into a room where we were shown a really old-fashioned film clip about how chocolate is made... it was completely in French. To be fair, we were provided with a pamphlet that summarized the movie in English, but it was extremely brief and difficult to read while watching the film simultaneously. The rest of the tour consisted of four rooms of old machinery, chocolate boxes and advertisements that were amusing, but not exactly worth the entry fee.... Also, there were maybe 5-6 descriptions in both English and Spanish, yet probably 30 or so in French. At the end, we got a couple small sips of their hot chocolate, which was rich but not the best. The tour ended in their little chocolate shop with some of the most expensive chocolate I've ever seen. Not a must visit site... but it can be interesting. Your choice.